Watches with such a long name have at least a long history. The company, which produces such watches have long been manufactured various kinds of accessories for athletes. Now, the light appeared and smart watches Martian Active Voice Command, with a fairly extensive functionality. Let’s see what they look like. 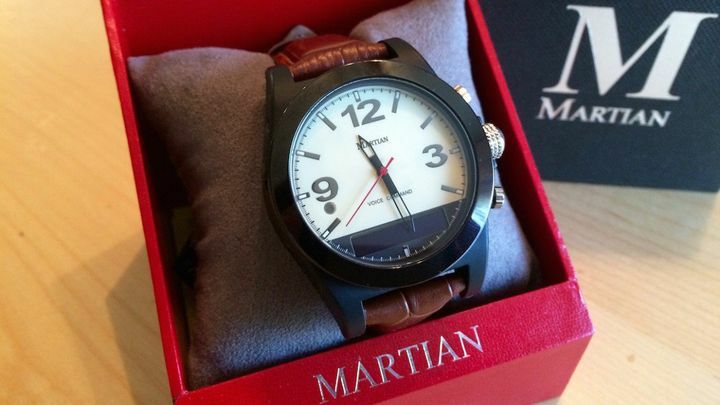 These watches are part of the collection Martian Active Collection, which was prepared with the Guess Connect. 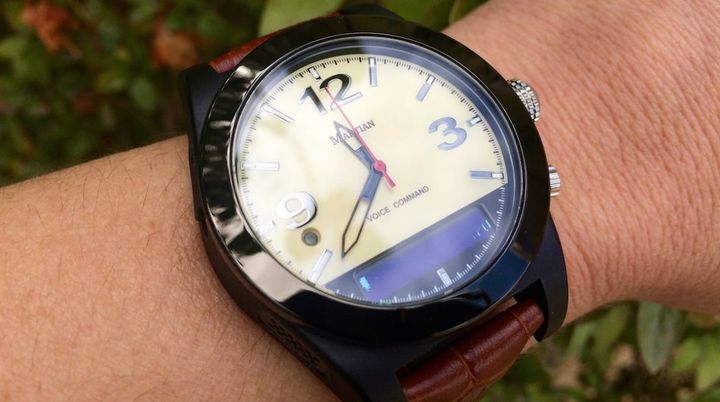 This model Martian Active Voice Command looks like a vintage mechanical watches for pilots. The dial looks quite unusual. The housing is made of durable nylon with mineral glass which is resistant to scratches. 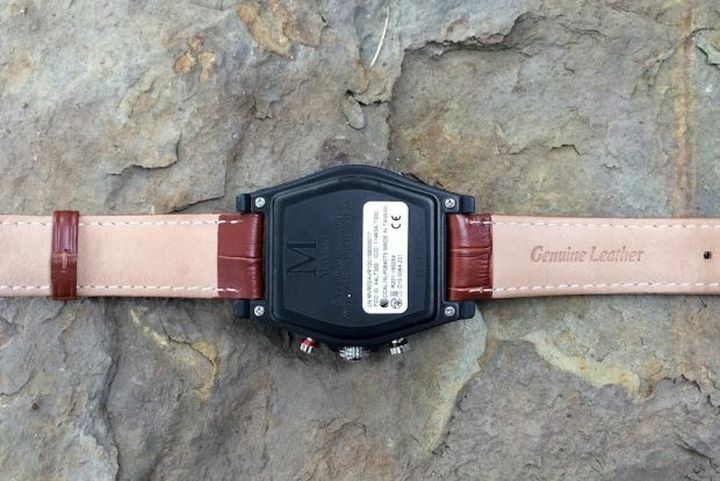 Removable belt – leather, with a picture in the style of an alligator. Hours are quite heavy – a male model, so the designers have decided to make them massive. When the device is not so severe as to cause discomfort when wearing. Case Diameter – 40 mm, and thickness – 15 mm. It’s not so much if we take into account the fact that the model is designed for men. Regarding female model, it is a little smaller than but generally similar design. On the right side Martian Active Voice Command – three mechanical buttons and a microphone. The top button activates the voice command, the user is connected with Siri, S-Voice, and Google Now. Average – a “crown”, used to control the movement. Knock and lower switches on and off the clock, displays the status, switch the menu. Left has a USB port, through which the charged hours and a small speaker. 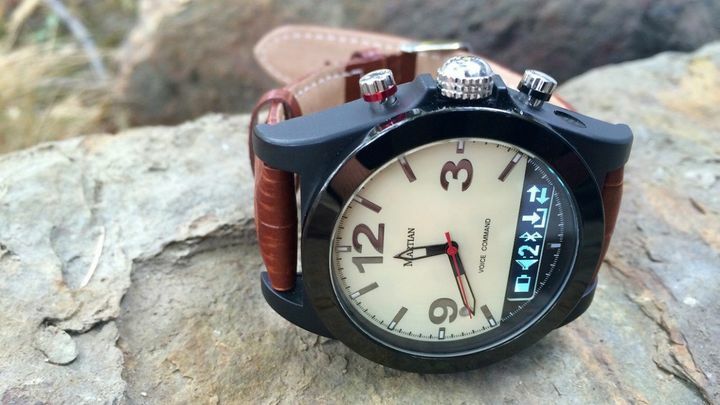 At the bottom of the dial has a small OLED screen that displays text notifications tethered smartphone. There is also an LED indicator that lets you know when a message comes when there is an incoming call and when the battery requires charging. The goal of the developers of these smart watches Martian Active Voice Command – a device that will look and work like a mechanical watch. This is the first. 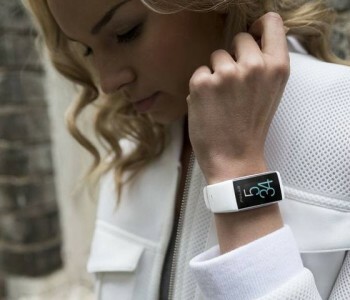 Second, developers are planning to add a number of features specific to the smart watch. It seems that they got it. As mentioned above, the clock displays the notifications that are displayed on the dial by means of a special screen. 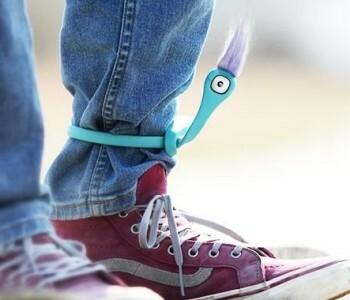 Thanks to the user Leash never forget your smartphone in the bar – the clock signal immediately begin as soon as the connection to the smartphone will be lost. Plus, Voice Command provides complete control over the smartphone voice assistant. There are “smart notification” sent from your smartphone, which give the watch to know the light vibration. The user can configure the number of times the vibration motor for each notification. For example, it is SMS – a vibration. Post to Facebook – two. And so on. The developers have provided even and quiet alarm clock, the operation of which is invisible to outsiders. This alarm can be set to wake up in the morning, and you do not wake up yet and your partner / partner. Interestingly, these clocks can be used to control the camera of your smartphone. The lower button controls the camera shutter. Thus, it is possible to move away from your smartphone, press the button on the clock, and take pictures of yourself. Similarly, you can manage and camcorder. 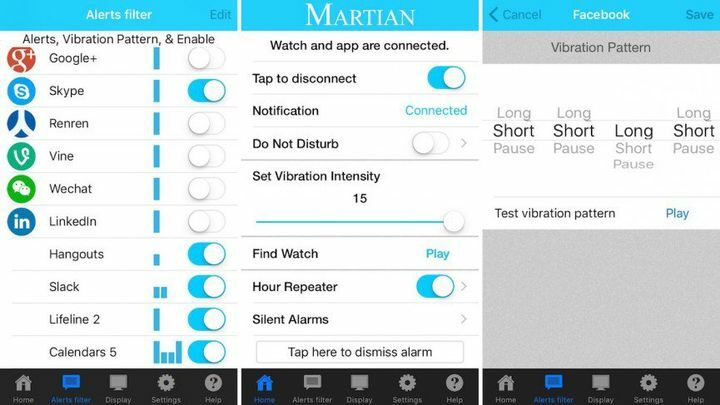 The most unusual Martian Active Voice Command features are the ability to watch Manage smartphone using Siri, S-Voice, and Google Now. 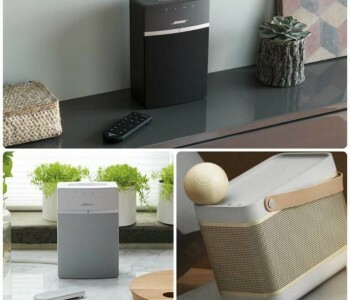 Communicate with the voice assistant can just through the Martian Active Voice Command, for which there are all possibilities – speaker, wireless microphone. Accordingly, it is possible to hear the voice assistant via the built-in clock speaker. As planned by the developers, the user can ask Siri assistant or other smartphones to read an important email or SMS. In the same way, you can create a calendar event, add notes, reminders, etc. Activating the voice assistant is made by pressing the upper right button. Interestingly, these watches have the opportunity to ask the assistant voice to read e-mail message through the speaker of hours, but they themselves Apple Watch – no. That’s bad luck. 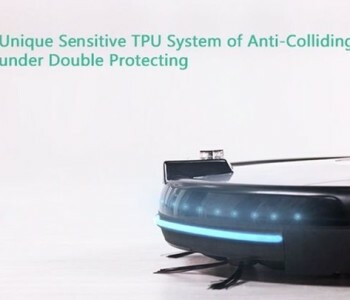 This feature can be useful when you’re driving. The sensitivity of the microphone and the quality of the speakers on top. 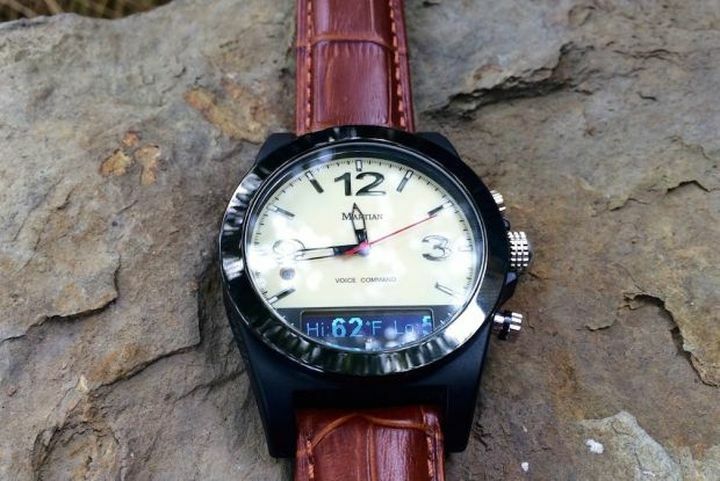 Because it is a hybrid of the mechanical and smart watch, then watch has its own application. 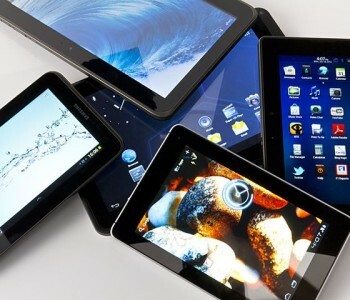 And it is quite functional, due to the fact that the clock setting using the buttons on the device – a complicated matter. The app allows you to adjust the intensity of vibration, set an alarm, set a list of notifications that you would like to receive. Attached is a list of applications that can send notifications to the clock, and this list to choose what you want for you. You can also choose the information that you need on the screen smart watches. Plus there are function disable or enable the LED. If he’s stopping you – that the LED can never use. The developers have provided and the ability to use sign language. 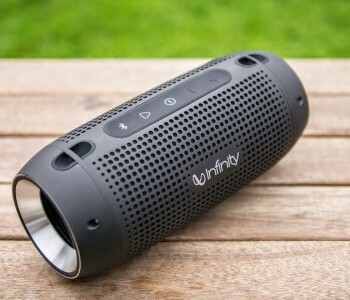 The manufacturer promises a solid lifetime hour of battery life – about five days. If you do not use smart features, the watch can work out for two years. Fully charging the battery takes around two hours. 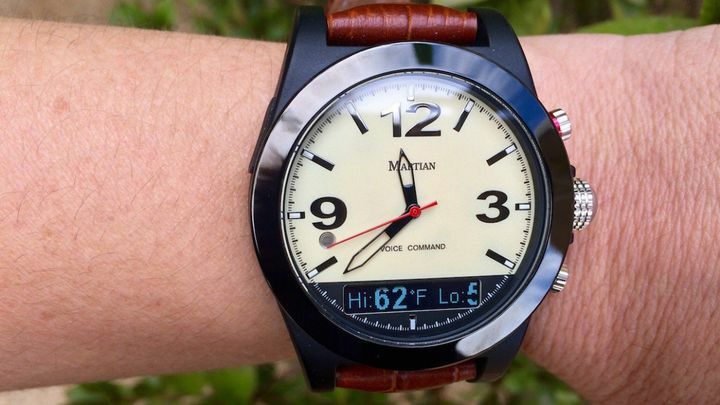 Smart Watch Martian Active Voice Command know how much. This is a great symbiosis of mechanical watches and electronic devices. Although they are a bit high for a small wrist watch design is very successful. If you value a mechanical watch, but would like to get and intelligent features, the Martian Active Voice Command is just what you need.